The Syrian opposition’s break with the Islamic Republic of Iran and its Lebanese cat’s-paw Hezbollah is total and has come into the open. The Syrian National Coalition of Revolutionary and Opposition Forces posted a statement on its Facebook page overnight accusing Iran and Hezbollah of waging open war on the Syrian people. The statement said in part, “The direct involvement of Iran-backed Hezbollah forces in the killings, crimes and attacks on Syrians—under the pretext of defending the Assad regime – has been well documented since the beginning of the Syrian revolution. “On top of that came fresh declarations by Iranian leaders, which can only be described as insolent meddling in the Syrian people’s affairs. The patronizing pronouncements amount to a declaration of open war on the Syrian people, such as the call for a rapid deployment force specialized in urban warfare to support the Assad regime. “Iran and its lackey Hezbollah’s involvement in Syrian affairs, and their flagrant aggression against Syria’s people and national sovereignty are inadmissible and violate international law. According to the Syrian opposition, fighting began on Saturday as Hezbollah fighters, in control of eight Syrian border villages, tried to move into three adjacent ones -- Burhanieh, Abu Houri and Safarja -- in the Qusayr region of Homs held by Syrian Free Army (FSA) forces. Regime helicopters fired rockets at rebel positions to support the advancing Hezbollah unit, which included pro-Assad militiamen recruited from the villages it controls, residents said. "The Hezbollah force moved on foot and was supported by multiple rocket launchers. The FSA had to call in two tanks that had been captured from Assad’s army to repel the attack," Hadi al-Abdallah of the Syrian Revolution General Commission told Reuters by phone. FSA spokesman Louay al-Miqdad called the Hezbollah operation an "unprecedented invasion", according to Beirut’s independent daily an-Nahar. "Hezbollah's invasion is the first of its kind in terms of organization, planning and coordination with the Syrian regime's air force," Miqdad was quoted as saying. An unnamed Hezbollah spokesman confirmed three Shiite deaths, but without saying whether they belong to the group. Several Syrian rebels were also killed in the clashes, which came days after a senior commander of Iran's Revolutionary Guards was killed travelling from Syria to Lebanon. The Syrian Observatory for Human Rights said Revolutionary Guards commanding officer Hassan Shateri was ambushed and killed by rebels while heading to Beirut from Damascus (see my February 14 post, “Iran point man killed heading from Syria to Lebanon). Shateri was a veteran of the 1980s Iran-Iraq war, and served in Afghanistan before going to Lebanon, where he posed as “Hessam Khoshnevis,” head of an Iranian agency set up to help rebuild Hezbollah-controlled areas devastated by the 2006 war with Israel. On the eve of Shateri’s burial last Friday in his hometown of Semnan, some 150 kilometers east of Tehran, Hojjatoleslam Mehdi Taeb, a senior cleric from supreme leader Ali Khamenei’s inner circle, said Syria is so strategic to the Islamic Republic that it is considered as Iran's 35th province, and that losing Syria would result in losing Tehran. He told university student members of the Basij militia: “Syria is the 35th province [of Iran] and a strategic province for us. If the enemy attacks us and wants to appropriate either Syria or Khuzestan [in western Iran], the priority is that we keep Syria.... If we keep Syria, we can get Khuzestan back too. But if we lose Syria, we cannot keep Tehran." Taeb – head of the Ammar strategic base, which is focused on cyber war and soft war -- also pointed to the Islamic Republic's support of Syrian militias through Iranian advisors inside the country. He explained, “Syria had an army, but did not have the ability to manage a war inside Syria’s cities. 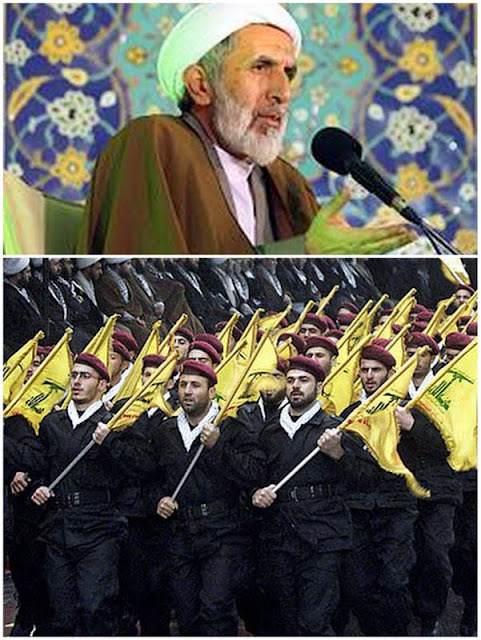 It is for this reason the Iranian government suggested that, to manage an urban war you must form a Basij…The Syrian Basij was formed with 60,000 [members] of the Party of God (Hezbollah), who took over the war on the streets from the army." Two Lebanese columnists, writing today for an-Nahar, slam both Hojjatoleslam Taeb and Hezbollah. Ali Hamadeh believes the “inevitable consequence” of Hezbollah’s “diabolic” and “criminal” involvement in the killing of Syrians will be to bring the conflict to the “heart of Lebanon” at the cost of innocent Lebanese lives.